Taking a trip to India can be a daunting experience, India is a hectic place, full of strange noises, smells and animals so here at Rishikul Yogshala our teachers and staff are here to help you feel at home and welcome you to the family as you take your 200 hour yoga teacher training. One thing we hear time and time again from all our graduating students is how much the course impacted on their lives, from the food they ate, the places they visited and the friends they made. Taking a 200 hour yoga teacher training with Rishikul Yogshala goes far beyond gaining a certificate; it is a life changing experience to cherish. You won't just leave Rishikul Yogshala with a yoga teaching train qualification you will leave with a heart full of memories created by the people that you meet. There will be up to 20 other yogis all on the same journey as you who will share the same experiences as you; the laughter and the tears. They will become lifelong friends creating a worldwide network of fellow yogis to support you on your future journey. 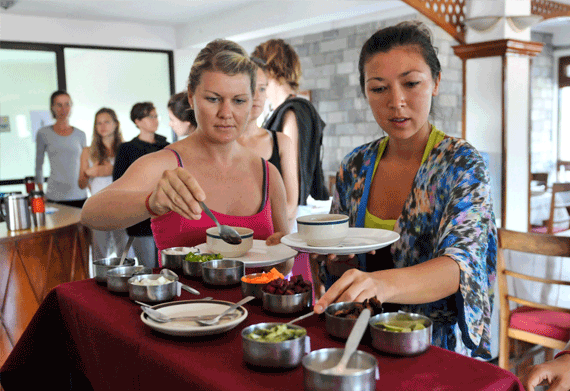 During your stay three healthy meals will be lovingly prepared in a yogic way by our cooks. The food is always healthy and nutritious, based on traditional Indian techniques. To complement the food and encourage an Ayurvedic diet there is a good supply of herbal teas to quench your thirst and cleanse your soul. A good meal leads to a smooth functioning of the body and this is exactly what we want for our students at every step. Filtered water will be available for both the yoga hall and your rooms or can be bought very cheaply from the local shops. Each weeks schedule allows for one and a half days off. During this time the school will organise local excursions to sights of interest. We visit local Ashrams, temples and waterfalls. Meditate to a sunrise at the top of a nearby mountain or complete your sun salutation to the rising of the sun on the beach of the Ganga. Partake in the dusk time activity of a Ganga Aarti, a powerful and spiritual experience. Whilst in India we couldn't let you leave without taking home extra skills, this will include learning to cook healthy Ayurvedic dishes by our expert cooks. We have onsite Ayurvedic practitioners who will be able to advise you on the best treatment to have to improve your health according to the ancient art of Ayurvedic healing. 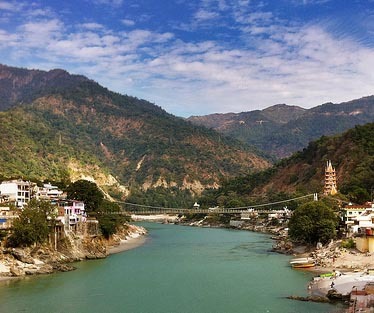 RISHIKESH The capital city of yoga, a pilgrimage town set upon the banks of the holy Ganges River is the headquarters for Rishikul Yogshala’s yogic dreams. 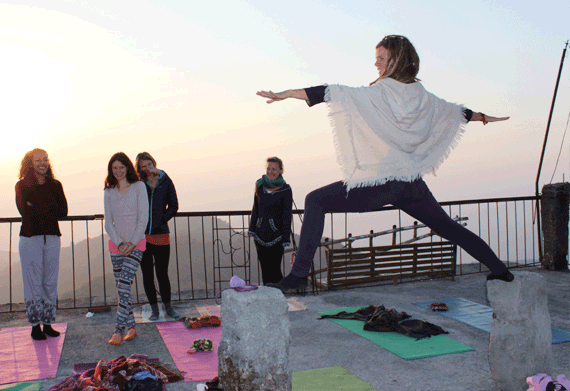 Joining our course in Rishikesh will ensure you a true yogic experience, from walking along the Mother Ganga, joining a satsang or conversing with a local Swami, there is always something to be in ore about in Rishikesh. KERELA ‘God’s own Country’ a rich landscape of coconut trees, calm backwaters and picture perfect beaches. Tucked away on the cliffs of Varkala, Rishikul Yogshala’s school is set in quiet location yet minute from the vibrant cliff top abundant with restaurants, shops and a perfect sea view. The sound of the shore and gulls in the morning is refreshing and relaxing. 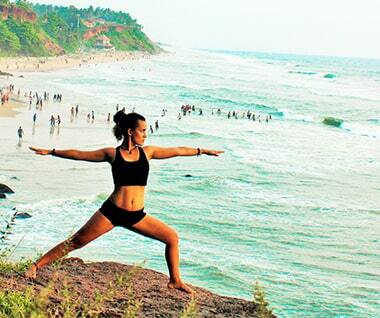 Varkala the home of Ayurvedic treatment our course will ensure you get fully immersed in this ancient healing practice to complement your yoga knowledge. 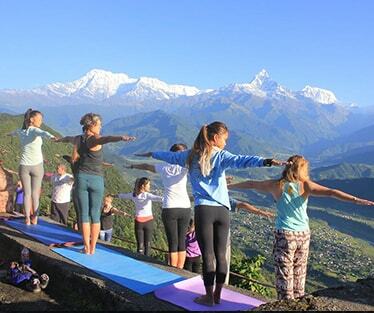 NEPAL We have picked Pokhara for practice of yoga for yoga teacher training course in Nepal. Hotel Tulsi, located at the touristy spot, overlooks the Annapurna Range and Lakeside, bestowing a calm effect on the onlooker. The big yoga hall, roof top mess, open green gardens and spa services, the list Is endless when the student sets foot at our location in Nepal.